The Nintendo 2DS is aimed squarely at two types of people: Nintendo fanboys (and girls) and consumers (and their kids) who have always been curious about Nintendo's handheld platforms, but could never justify plonking down the money for one of them. The former will probably buy it to satiate their Nintendo leanings the month it's released. For the latter, the 2DS offers a cheap, no frills entry into one of the best gaming catalogues on the planet. The Nintendo 2DS bears only a passing resemblance to its DS predecessors. While the vibrant colour scheme is present and correct, the iconic clam-shell structure is gone, as is the sleek matte (Nintendo DSi) and glossy (Nintendo 3DS) finish. The surface of the console's plastic casing is rough to the touch and feels quite cheap. The 2DS is also flat and not very sleek – rather it feels like a budget gaming slab. That having been said, you can't pinch an inch on its functionality. The 2DS offers the exact same interface as any other Nintendo DS; one thumbstick, a D-pad, four face buttons, two shoulder buttons, a Start button, a Select button and a Home stud tucked in below the second (lower) screen. There's a slot for a memory card – a 4GB card comes bundled with the device – a recharge jack, a headphone jack and a stylus, that slides into the a slot on the device's reverse side. The 2DS also has a forward-facing camera and a 2-lens camera on its back that's capable of taking 3D pictures – even though the console isn't capable of displaying them in 3D. Along with its less compact design, the lack of a 3D screen is – as its name suggests – the 2DS's most notable drawback. Granted the 3DS's catalogue is perfectly playable in 2D and, but for the exception of Super Mario 3D Land – one of the few titles in which 3D is a plus – the 2DS is an absolutely adequate platform to play them on. Owners also need to head into the console's main menu to take it offline – there's no handy side-slider to turn off the console's Wi-Fi – and it only boasts one speaker. The 2DS, it seems, is best enjoyed with a pair of headphones. We're also uncertain about how durable the twin screens are; we didn't feel comfortable submitting the loaned unit to a rigorous knock-about commute to work. It's probably a safe bet to suggest that picking up a case for the 2DS is a must. The console's trump card, though, is the catalogue of games it allows one to play. Even without 3D capabilities – which, admittedly, in most 3DS games is just a gimmick – the 2Ds is worth recommending to anyone who hasn't yet samples the delights of the DS library. 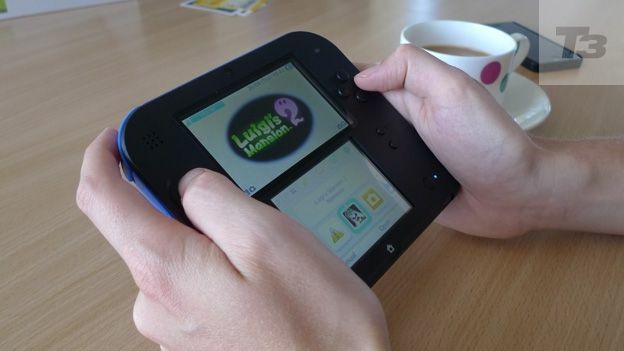 Luigi's Mansion 2, Fire Emblem, Donkey Kong Country 3D, Animal Crossing: A New Leaf – the last four months of 3DS releases alone are enough to justify the 2DS's £109 price tag. And that's before one delves into the likes of Professor Layton, Hotel Dusk, Pokemon and the vast array of Mario titles available for the device. The Nintendo 2DS feels like a budget device and it has no 3D screen capabilities. If you can get over those two caveats then this console offers the best value for money on the market at the moment. The catalogue of games available to play on it is arguably one of the best in existence and, at a time when every other console manufacturer is hyping up the notion of upgrading for the future, it's rather refreshing that Nintendo is reminding gamers that 'bigger' isn't necessarily 'better'.